Many celebs sporting the short crop or the pixie have left us itching to just chop off our hair. If that’s the case for you as well, then have a look at these smashing hot 18 hairstyles for short hair. For those of you saying ‘I can never pull it off’, think again. Short hair is suitable for almost all face types and it’s so low-maintenance. If these reasons are not enough, a short crop is so full of attitude, you are sure to turn heads wherever you go. Contrary to popular belief, short hair leaves a lot of room for styling, just see the styles to know how! For a look that works well with formal clothing and casual clothing, get a longish fringe and blow dry it to the side. Mess up your hair using a little leave in conditioner and serum. Draw attention to the fringe for a neat but cocky look. 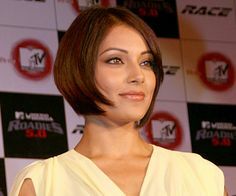 If you are blessed with straight hair (or have straightened it artificially) go for an asymmetrical crop. Keep the front long, and the back almost minimal. The different lengths of your hair allow you to style your hair differently depending on the occasion, or not style it at all (which is the best part about short hair). You could also braid your crown, add a cute little pin and be ready to step out. Yes it’s that simple! This look is all the rage with the celebs right now. Our little tip- it works best if you try thin streaks of color. Leave in conditioner is your best friend in this case (or any other for that matter). The shorter your hair is, the more it tends to frizz. Sleek back your hair to keep it in place and still appear feminine and elegant. Another option is to use the leave in conditioner almost like guys who use gel to ‘spike’ their hair. Whether you are looking for a complete makeover, or are just looking for something that makes getting ready in the morning a tad bit easier, pick one of these funky styles and get started!